There was not a lot of new legislation in 2014 impacting California Community Associations, and what changes there were seemed to be focused on dealing with the drought. There were also changes to the law relating to solar energy systems, the ability of residents to grow fruits and vegetables in their backyards, to bring their attorney to an IDR meeting, and defining responsibility for the repair and/or replacement of exclusive use common area. The big story for 2014 was implementation of the complete rewrite of the Davis-Stirling Act (signed into law prior to 2014 and effective as of 1/1/14). If you have not been made aware of this by now, you likely live in a cave, as the Davis-Stirling Act has been rewritten and renumbered to Sections 4000 through 6150 of the California Civil Code and specifically excludes commercial associations, which now have their own set of laws that are much more abbreviated then the Act. Many association attorneys have prepared conversion charts for their clients which reference the old code sections and the applicable new sections. Contact your association’s legal counsel now if this is your first time hearing about the new Davis-Stirling Act. This bill amends Civil Code § 4735, which deals with low water-using plants in residential associations, by adding a new subsection (c) which prohibits community associations from imposing a fine or assessment against a member for reducing or eliminating the watering of vegetation or lawns during any period for which either: (i) the governor has declared a state of emergency due to drought, or (ii) a local government has declared a local emergency due to drought. AB 2104 will clarify and further amend Civil Code § 4735 in two ways. Civil Code § 4735 currently provides that “governing document” provisions that prohibit or restrict the use of low water-using plants are void and unenforceable. AB 2104 amends the statute to also apply to: (1) provisions in architectural and landscaping guidelines and policies, and (2) provisions that prohibit or restrict the use of low water-using plants to replace existing turf. This bill further amends Civil Code § 4735 to add an exemption for community associations that use recycled water for irrigating landscaping from the fining prohibition in Civil Code § 4735 (originally added by AB 2100). Follow this link to read more about the drought related legislation. Under current Civil Code § 714, an association can have restrictions on solar energy systems so long as the restrictions do not significantly increase the cost of the system or significantly decrease its efficiency or specified performance. “Significantly” used to mean increasing the costs by 20% (or $2,000 for photovoltaic systems) or reducing efficiency by 20%. AB 2188 (effective 1/1/15) redefines the term “significantly” to mean increasing the costs by 10% (or $1,000 for photovoltaic systems) or reducing efficiency by 10%. AB 2188 also reduces the number of days within which an association must approve or deny an application for the installation of a solar energy system from 60 days to 45 days; otherwise, the application is deemed approved. Follow this link to read more about the new solar energy system legislation. Under AB 2561, any provision in an association’s governing documents that effectively prohibits or unreasonably restricts the use of an owner’s backyard (in a lot or exclusive use area) for “personal agriculture” will be void and unenforceable. “Unreasonably restricts” means significantly increasing the cost of engaging in personal agriculture or significantly decreasing its efficiency. This bill expressly clarifies and resolves a long-standing debate on who is responsible to repair or replace exclusive use common area. Civil Code § 4775 will now provide that exclusive use common areas are to be maintained by owners but repaired and replaced by the association, unless the governing documents provide otherwise. 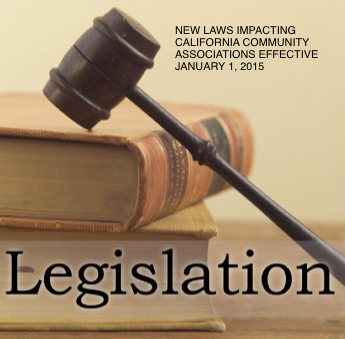 To give community associations time to implement this new law (because some associations were not assigning repair or replacement responsibility as the code will require), this new law does not go into effect until 2017. Follow this link to read more about the changes to Civil Code § 4775 that will take effect on 1/1/17. This bill amends Civil Code §§ 5910 and 5915 by providing that Internal Dispute Resolution (IDR) settlement agreements will only be judicially enforceable if signed by both parties. Also, the amended code allows both parties to be “assisted by an attorney or another person at their own cost” during the IDR process. Essentially, this means that owners can bring their attorneys to an IDR meeting and are not required to provide the Association with advance notice that they are doing so. Follow this link to read more about the changes to the law impacting Internal Dispute Resolution (IDR). AB 2430 amends Civil Code §§ 4528 and 4530 by changing the statutory disclosure form (§ 4528), which must now itemize and separately state the cost for providing each document to a selling owner or a recipient authorized by the owner, by clarifying that the written estimate of fees for providing the requested documents must be sent prior to processing the request; by prohibiting an association from bundling documents not required by § 4530 with documents required under the statute; and by requiring that any fees for any required documents be distinguished from, separately stated, and separately billed from, all other fees, fines, or assessments billed as part of the transfer or sales transaction. It also now states that it is the responsibility of the seller to compensate the association, person, or entity that provides the documents required to be provided by the owner pursuant to § 4525 to the prospective purchaser. Follow this link to read more about the changes to the law impacting Transfer Document Disclosure Fees.